Are you ready for an October full of posts? I hope so (and I hope I follow this through)! I'm kicking off this Blogtober by talking about one of my favourite things about the Autumn period and about October, the month of spookiness. 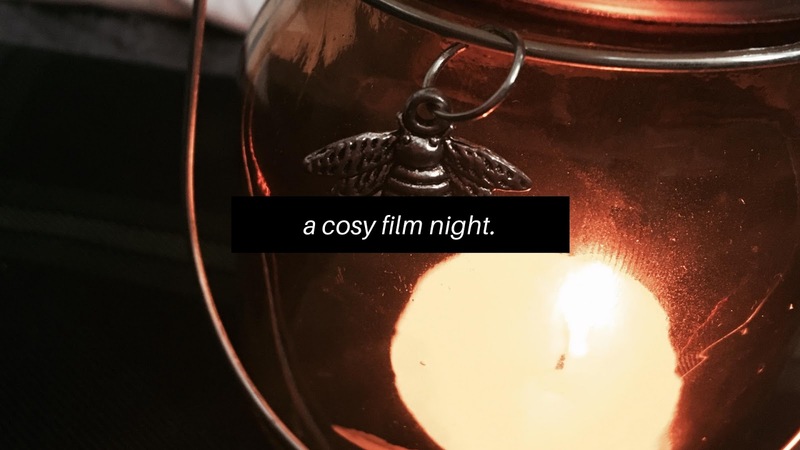 A good cosy film night! It's one of the first things that comes into my mind when the leaves begin to fall! The idea of being snug (as a bug in a rug) and cosy with a nice mug of something hot and watching one of the films that make me feel so nostalgic! Let's talk about the fundamentals of getting cosy. When it comes to blankets, the more the merrier! If you're chilling on the floor then you can cover the floor with blankets to make it all soft and comfy. If on the sofa, wrap yourself up like a cocoon! Duvets are also a great idea! For optimum comfort, baggy clothes are a must! You don't need layers since you can layer up the blankets, so just wear those PJs or those sweatpants! My fave source of warmth is a hot drink! Coffee is good for getting that energy up for a good marathon, but hot chocolate really warms the soul and winds you down! Pick out your fave mug and get that kettle boiling! Warm hearty food is also such a good shout! Whether you're a solitary being or someone who likes to surround yourself with your favourite people determines whether you need the company to get comfy and cosy. If you're solitary and pushing yourself to interact with others, you won't get to relax properly! It's the same for if you're super social. Don't want to get lonely and distracted by social media for some interaction! Halloween Classics - These are your standard spooky feeling films... The ones you may have been watching as a tradition every October whilst waiting for Halloween to roll around! Romances - Gotta warm the heart sometimes, and these romances sure do that! Nostalgia - I don't know why, but as soon as the cold weather hits, all I want to do is get cosy and get nostalgic! Here are a few of my faves for doing this! Musicals - With friends or all alone, who doesn't love a singalong? I didn't realise there were so many Halloween movies! I need to start making my way through them. I'm preparing myself for autumn with a cosy night in my pyjamas with lots and lots of tea.